I didn't pay much attention to Darksiders III prior to its launch. I watched a couple of gameplay videos when it was announced, and thought it looked rough – to the point that I was surprised the footage was shown. With Vigil Games out of the picture as developer, and that first look leaving a bad taste in my mouth, the alarm bells were sounding for Darksiders III. I feared it wouldn't live up to the series' first two entries. In the months that followed the announcement, none of the news or trailers caught my eye. It was just kind of there, and I figured I would learn everything I needed to know about the game when the reviews hit. Those reviews ended up being all over the place, and didn't help me make a quick decision. I realized I had to roll the dice on this one, and based my decision on points made in two reviews: Game Informer's and IGN's. I obviously have a bias with Game Informer, but more so trust Kyle Hilliard's word. His interests in games line up with mine most times. In his Darksiders III review, Kyle said that it has "gameplay and level designs that sing" and "feels like an old comic book with vibrant colors and villains that personify their names." I found those comments intriguing, as they lined up with my thoughts on the series' previous two entries. I still wasn't entirely sold, however, and it wasn't until I read IGN's review by Daemon Hatfield that I should buy this game. In his review he said, "the straightforward simplicity of Darksiders III is a refreshing change of pace after exploring so many dense open-world games." Since I just finished up Fallout 76 and Red Dead Redemption II, this sounded like a great palate cleanser. Beat the snot out of demons, and don't worry about being over-encumbered. I was onboard. 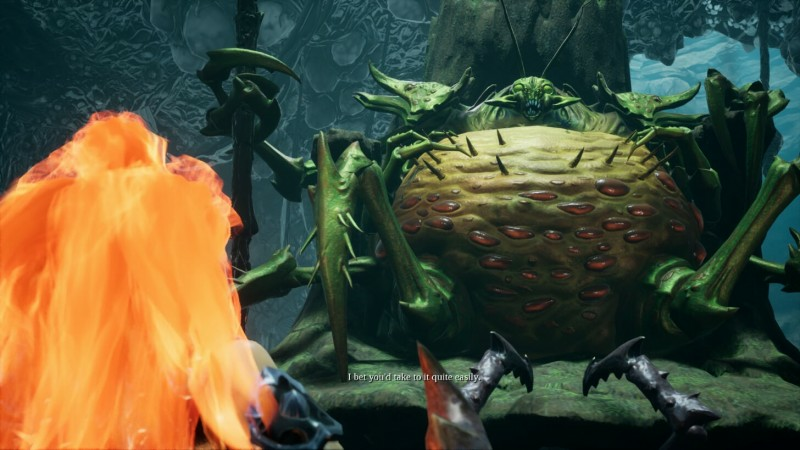 I don't know if I glossed over specific lines in the reviews or if I just expected Darksiders III to be more of the same for the series, but I wasn't prepared for it to be a bona fide love letter to Dark Souls. It kind of broke my mind. No puzzle-laden dungeons. No real nods to the Nintendo classics. Just Dark Souls. What does that mean exactly? Here's how gameplay unfolds: Most enemies are tough. They drop souls. I collect these souls and give them to a vendor who in exchange rewards me with attribute points. If I die while carrying these souls, they drop, and I need to retrieve them. I also collect different sized soul clusters that I can crack open to get more souls. Sound familiar? The blueprint is the same. Even the world design moves more toward the free-form format with the player discovering fast-travel portals. Yes, I miss the puzzle dungeons, which, in hindsight, were the backbone of the experience, but Darksiders' DNA is still present in the combat. It's acrobatic, combo-laden, and feels damn good. While it looks and controls like the Darksiders of old, you have to think about it in the context of Dark Souls, since...well...it's heavily inspired by it. Some enemies can be toppled with reckless abandon and a flurry of combo strikes, but most encounters start as a slow dance. Any foe that looks tough usually is and must be approached with caution. You look for windows, and react. The game rewards this approach well through an excellently designed evade maneuver that delivers a powerful counter attack if executed with perfect timing. Once an enemy weakness is exposed, it again turns into Darksiders with a whirlwind of stylish attacks being unleashed. The result is a combat system that has its own beat, embracing both the calm and subsequence storm in fun ways. This is Sloth, one of the bosses based on the seven deadly sins. The boss battles are particularly well designed. Fury faces off against a wide variety of sizable beasts, each depicting one of the seven deadly sins. I'm still working my way through the game and can't speak to all of them yet, but I've downed three of them, and have been impressed with the conflicts that unfolded. Not only do the bosses look cool, they don't just default to one or two attacks – there's complexity to these encounters and you have to study them to truly know what they are capable of. While Darksiders III is a clear homage to Dark Souls, it never hits the same crushing difficulty levels. Yes, you may die on a boss a few times, or an enemy may work you when you are off your game, but healing items are in great abundance, as are items that can resurrect you or buff your attacks. You can also turn into a demon that is invincible for a short period of time. If you want the game to be super challenging (or even less), you can change the difficulty at any time. 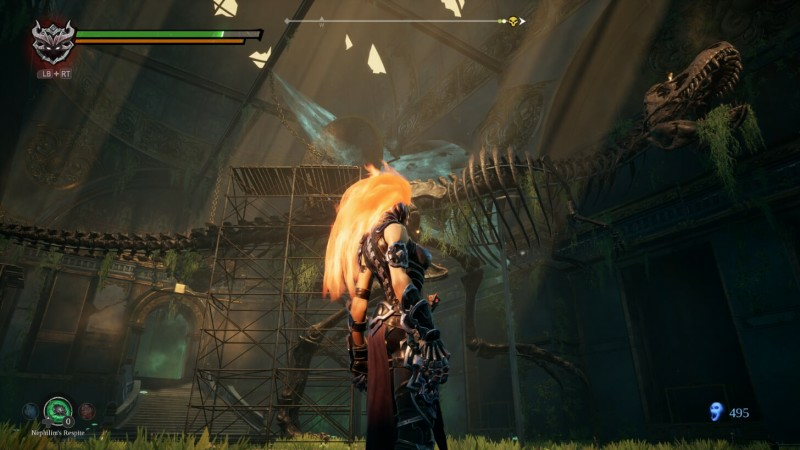 I've also enjoyed exploring Darksiders III's world, which is fairly small, but striking in detail (as you can see in the picture above). Valuable items are littered everywhere, and I've run into a number of nicely designed environmental puzzles. I appreciate how the world loops back in on itself, making it easy to backtrack without having to fast travel. There's a bit of a chop to the framerate, and I couldn't even begin to tell you what this game's story is really about, but don't let those things scare you – the gameplay is damn good. I thoroughly enjoyed Lords of the Fallen a few years back for its ability to scratch my Dark Souls itch, and Darksiders III is doing the same thing. No, I don't think it touches any of the "Souls" games in terms of the quality of the adventure or the intensity of combat, but it's still fun and a type of experience I am now realizing I want more of.